DID a time traveller from the future go back 350 years with an iPhone and get painted in the process? Apple CEO Tim Cook thinks it may be possible after being convinced someone in a painting from the 1600s is holding the firm’s product that has revolutionised how we communicate. He explained how he discovered the painting, which described the smartphone as a letter. “Man Handing a Letter to a Woman in the Entrance Hall of a House” was painted by Pieter de Hooch in 1670. Mr Cook said while visiting Amsterdam for the Startup Fest Europe, he visited the Rijksmuseum with a retired Dutch politician called Neelie Kroes, when he spotted the oil painting masterpiece. Could he be holding an iPhone (seen left)? He told TNW the “iPhone” in the painting did appear to be one of those made by his firm. Cook actually believed the painting was a Rembrandt during the interview. 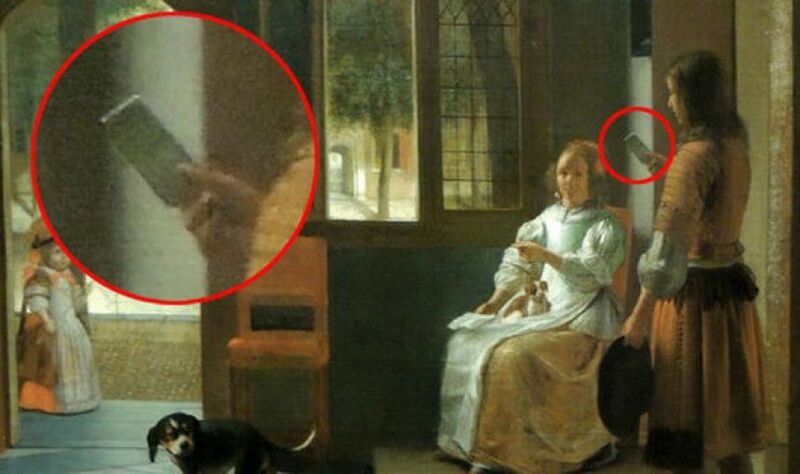 Others have said the man in the painting could be holding an “old school” iPod with a click wheel. The story compounds rumours Apple has been experimenting with time travel already, and it is not the first time there have been claims of the iPhone – invented in 2007 – cropping up in historical scenes,. In a clip from the 1948 John Wayne film Fort Apache, late actor Henry Fonda can clearly be seen using what many have said can only be an iPhone. And, earlier this month footage appeared of a Mike Tyson fight with an audience member apparently filming the bout on a smartphone.